The Palazzo Strozzi in Florence is a leader in progressive museum practise. Each of their exhibitions represent a bold step forward in planning and execution, featuring advancements in thematic design, signage and interactivity. 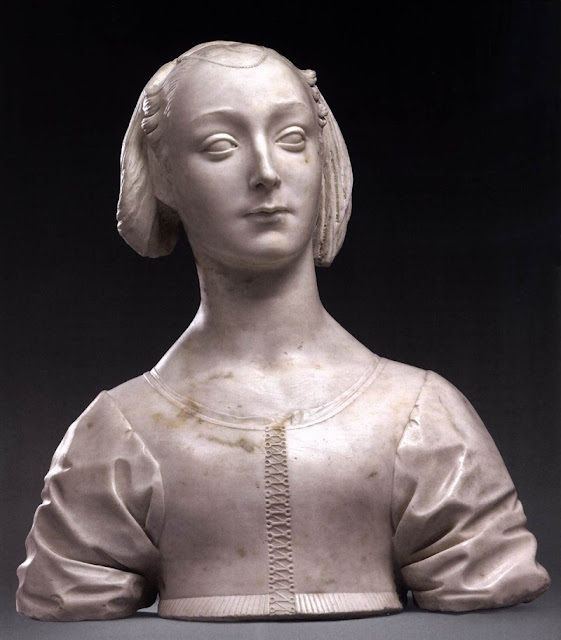 Commencing on March 23 2013, the Palazzo Strozzi will launch its first collaborative effort with the Louvre Museum, The Springtime of the Renaissance: Sculpture and the Arts in Florence, 1400-1460. Owing to its potential interest to 3PP readers, a detailed outline of the exhibition is presented here in English. The exhibition sets out to illustrate the origin of what is still known today as the “miracle” of the Renaissance in Florence predominantly through masterpieces of sculpture, the form of figurative art in which it was first embodied. Following its debut in Florence, where it will be on view from 23 March to 18 August 2013, the exhibition will be shown at the Louvre in Paris from 23 September 2013 to 6 January 2014. The lengthy preparation that has gone into the staging of the exhibition, curated by Beatrice Paolozzi Strozzi, director of the Museo Nazionale del Bargello, and Marc Bormand, curator-in-chief of the Département des Sculptures in the Louvre, has been accompanied by an extensive restoration campaign in both Italy and France. Visitors to the exhibition will be able to admire many Renaissance masterpieces, including works by Ghiberti, Donatello, Dello Delli, Filippo Lippi, Nanni di Bartolo, Agostino di Duccio, Michelozzo, Francesco di Valdambrino and Mino da Fiesole, in their newly-conserved splendour. 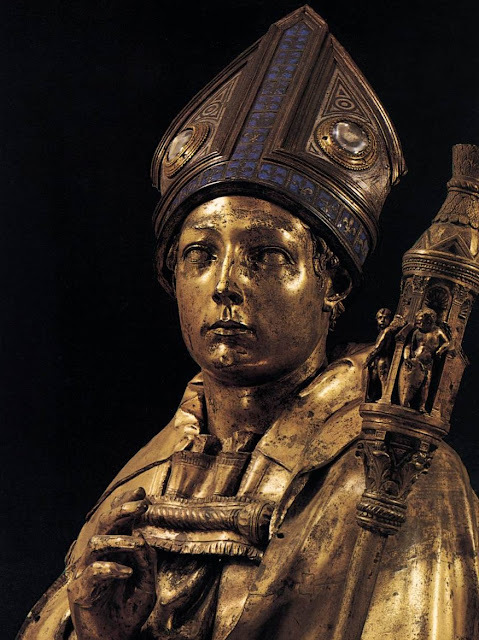 One of the most significant projects undertaken for this exhibition is the conservation of Donatello’s imposing bronze statue depicting St. Louis of Toulouse, 1425, from the Museo dell’Opera di Santa Croce where it has been throughout the restoration in a workshop especially set up in the museum and open to the public. 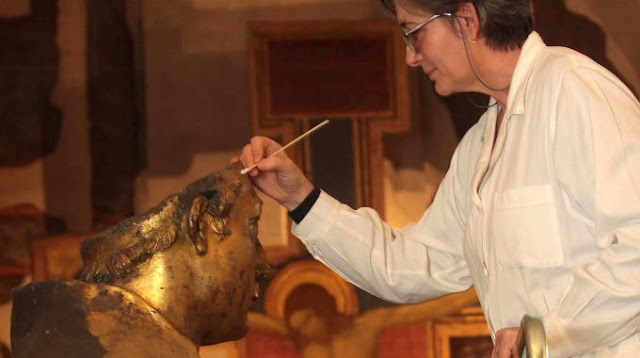 The conservation was entrusted to Ludovica Nicolai, who was responsible for restoring Donatello’s David in the Bargello, with the assistance of the Opificio delle Pietre Dure’s scientific laboratory. Opens with an intriguing overview of the rediscovery of the classical world with some splendid examples of the 13th and 14th century works by Nicola and Giovanni Pisano, Arnolfo, Giotto, Tino di Camaino and their successors, who also assimilated the expressive richness of the Gothic style, in particular from France. The ‘new era’ coincided with the start of the new century and is represented in the exhibition by two panels depicting the Sacrifice of Isaac by Lorenzo Ghiberti and Filippo Brunelleschi from the Baptistry doors, and Brunelleschi’s model for the cathedral dome. At that time, the writings of the great Humanists, singing the praises of the Florentine Republic’s political achievements, its economic power and its social harmony, were spreading the legend of Florence as heir to the Roman Republic and as a model for other Italian city-states. 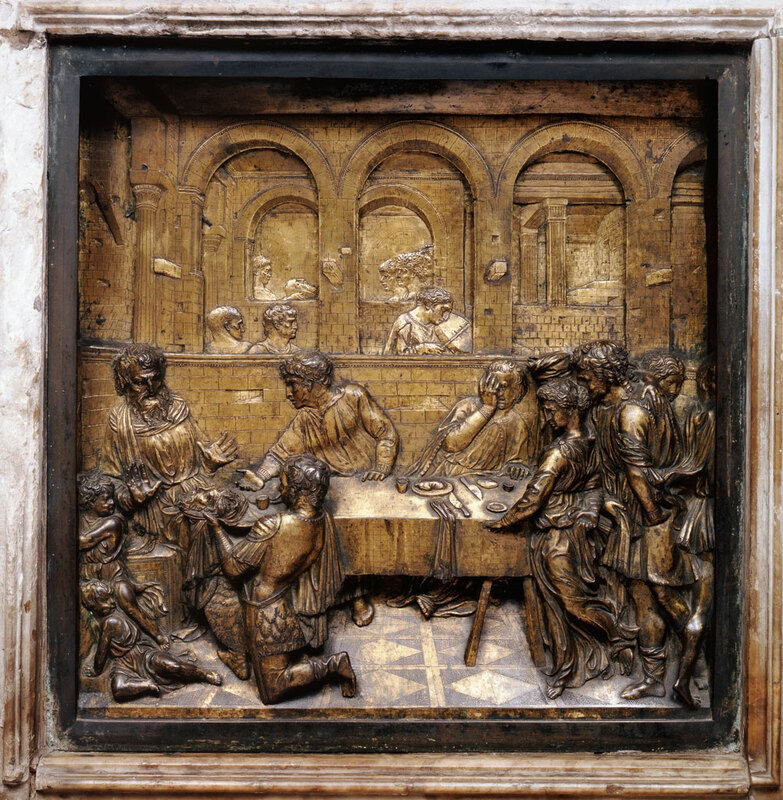 Monumental public sculpture, through the masterpieces of Donatello, Ghiberti, Nanni di Banco and Michelozzo, created for the city’s major construction sites – the Cathedral, the Bell Tower, Orsanmichele – is the first and loftiest expression of the transformation under way and of the triumph of Florence and its civilisation. The exhibition also sets out to illustrate the other themes of classical antiquity that were assimilated and transformed through sculpture in this new Renaissance language, which lent its voice not only to the city’s creative fervour but also to its spiritual and intellectual mood. Sculpture, and more especially statuary, was thus to have a tremendous impact on the painting of the leading artists of the time, men such as Masaccio, Paolo Uccello, Andrea del Castagno, Filippo Lippi and Piero della Francesca. Andrea del Castagno. 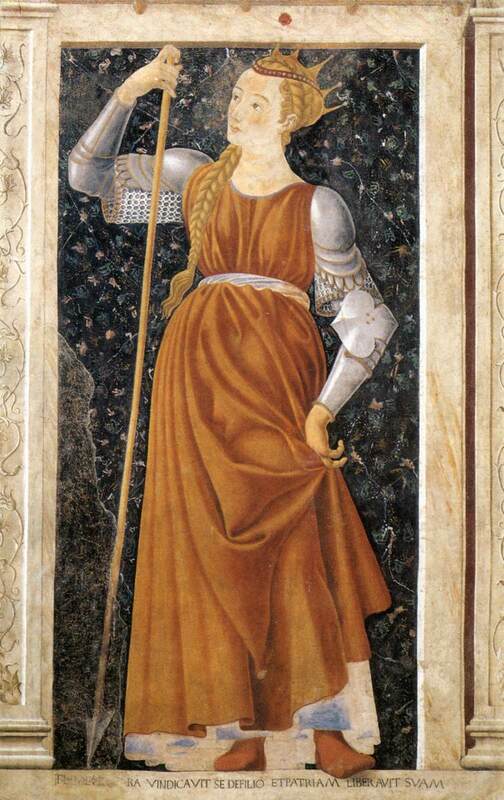 Queen Tomyris. 1448-9. The search for a “rational” space and Brunelleschi’s discovery of perspective were implemented in the most advanced forms in the art of sculpture, in Donatello’s bas-reliefs – for instance in the predella of his St. George from the Bargello or in his Herod’s Banquet from the Musée des Beaux-Arts in Lille. This echoed well into the middle part of the century in the work of Desiderio da Settignano and Agostino di Duccio in an ongoing dialogue/debate with painting, including that of the classical era. From the 1420s onwards, the new standards of sculpture perfected by the great masters and illustrated in the exhibition by several masterpieces such as Donatello’s Pazzi Madonna from Bode Museum in Berlin, the Kress Madonna from the National Gallery in Washington, and the Madonna from the Diocesan Museum of Fiesole attributed to Brunelleschi, spread out via a seemingly endless output of bas-reliefs for private devotion (in marble, stucco, polychrome terracotta and glazed or “Della Robbia” terracotta), which fostered the widespread propagation of a taste for the ‘new’ beauty in every level of society. 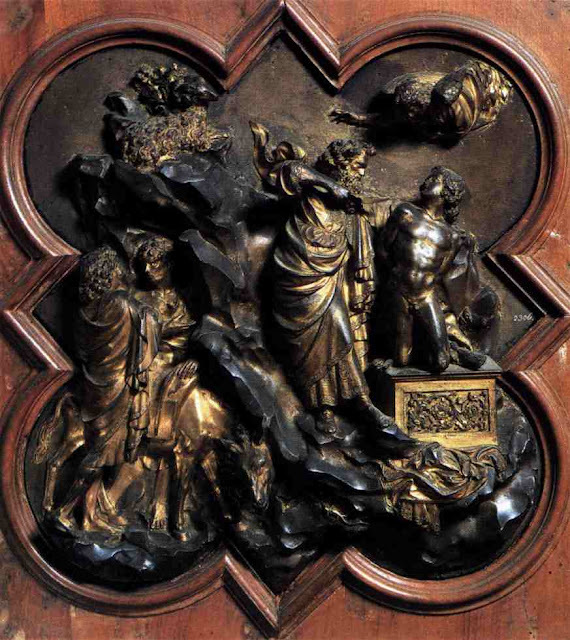 At the same time, the most prestigious artistic commissions in Florence, which were almost always from public entities, began to focus on venues of solidarity and of prayer (churches, confraternities and hospitals), where sculpture once again played a primary role. Thus, arranged around the city’s absolute symbol – the wooden model of Brunelleschi’s Cupola for Santa Maria del Fiore – the exhibition offers a retrospective of themes and types of sculpture that were also to have a crucial impact on the development of the other figurative arts, in a direct debate with their classical predecessors, from the tombs of the Humanists, to the inspiration provided by ancient sarcophagi, to the rebirth of the equestrian monument and the carved portrait. The carved portrait, which became popular towards the middle of the century – in the marble busts of Mino da Fiesole, Desiderio da Settignano, Antonio Rossellino and Verrocchio – heralds the transition from the fiorentina libertas, represented by public patrons, to the private patronage that already bore the mark of the Medici family’s impending hegemony. This transition is effectively captured in the culmination at the end of the exhibition with the Wooden Model of Palazzo Strozzi, the most illustrious private residence of the Renaissance. The catalogue, edited by Beatrice Paolozzi Strozzi and Marc Bormand will be published in Italian, French and English, will contain contributions from many of the leading Italian and foreign experts in the field of Quattrocento art, with numerous theme-based essays and with scholarly entries for each of the exhibits. Content adapted from press release items courtesy Sue Bond Public Relations UK and the Fondazione Palazzo Strozzi. This sounds like a great exhibit! The short time period and the thematic organization seem like something really different. Thanks for the overview -- hoping for a review after (not if!) you go! Hello Karen! It is an absolutely tantalising exhibition. I am hoping 3PP will be able to host some type of coverage. This is enough to make me want to go back this year (not that it would take much...)! To see so many examples from that time period, especially so many I have not seen before, would be very exciting. Thank you for the comprehensive coverage, Hasan. Cheers for the comments Jenna. Many of the exhibitions announced for this year seem to present something unique and wonderful. In this instance also, another strong step forward for the innovative Palazzo Strozzi in their advanced collaboration with the Louvre.